Join us as we explore the myth and mystery of the Egyptian Lion-headed Goddess Sekhmet. The energy of the Solar Feminine is ex-pressed in the ancient Egyptian myth of the Solar Goddesses Sekhmet and Hathor. Since this energy is so much a part of the Divine Feminine, many people are experiencing the shamanic journey of disintegration and renewal that is related through this mythology. Sekhmet and Hathor truly are two dimensions of the same Goddess. 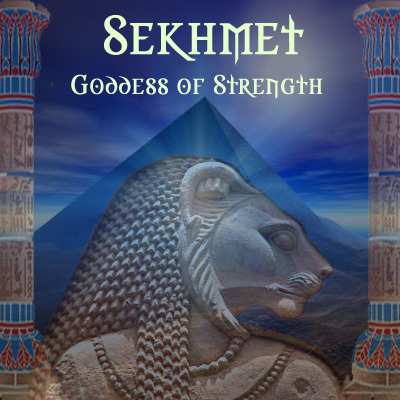 Though Sekhmet and Hathor are both great Goddesses of power to be respected and held in awe I wish to dispel some of the fear surrounding particularly Sekhmet as a result of her mythology. Many may be familiar with the myth of the children of Ra who became immoral and disrespectful to the God Ra. It is said that He sent forth Sekhmet the "Eye of Ra" to eradicate this corrupt element within the children of Ra. The story goes on to say that Sekhmet went on a killing spree slaughtering entire populations. It is said that to the horror of the Gods, Ra included, that Sekhmet's appetite could not be satiated until Ra called upon the Lord Thoth or Tehuti to intervene. Red dye was mixed with beer and poured upon the desert near Sekhmet's most recent activity. As she lapped up the red beer she became inebriated and passed out. As a result of this altered state, when she came to she was transformed into Hathor, the Solar Goddess of Joy; a fiery Goddess also expressed in her manifestation as the Cobra Goddess who protects the crown and the vision the Pharaoh. What this myth is telling us however, is not a story of unpredictable wild rage of the divine feminine that must be appeased in some way. Sandra Ingerman, author of "Medicine for the Earth" discusses in her book a shamanistic state reminiscent of the destructive elements of Sekhmet in this myth. This phenomenon is experienced cross-culturally in what Ingerman refers to as the shamanistic journey into "Dismemberment". She devotes an entire chapter to her experiences with this form of shamanistic healing and transformation and how many of her students have experienced this quite spontaneously even before any prior formal training or study in shamanic healing. This is what I feel Sekhmet is trying to tell us and demonstrate in her myth as one and the same as shamanistic dismemberment. Ingerman says that in "dismemberment" journeys, people often experience being torn limb from limb by an animal for example or find themselves reduced to bare bone in some way. The process of dismembering the physical body is symbolic of our need to let go and become unburdened by any and all hindrances in ourselves, our lives and our psyche to experience and merge with the light of the Creator in the purest sense. It is a journey of surrendering our fear in order to experience total connection and union with the divine. We carry attachments and burdens at so many levels; physically, mentally, emotionally and spiritually. Sekhmet is the Goddess of Purgation according to Egyptologist Rosemary Clark, and in keeping with the cross-cultural shamanic experience of dismemberment, Sekhmet is facilitating total annihilation of those self sabotaging energies, behaviors and consciousness we are consciously or unconsciously carrying around. These very perceptions and false beliefs about who we are distract us from conscious connection with the divine in body, the Light as symbolized in the God Ra, or Isis the Female Ra. This powerful, pervasive radiance is what Diane Stein calls in her book "Reliance on the Light" the 'Light beyond the Goddess'; it is the pure light of creation. When we merge there, egoic labels and perceptions fall away. In such radiance they are no longer necessary. We become pure as children again in the respect that we no longer are concerned with what others think of us, we just move into the Divine Feminine consciousness and state of "being". The transition from Sekhmet to the personae of Hathor in the myth exemplifies what we as individuals achieve when we unburden ourselves of all the baggage and self contempt of the negative ego. Hathor will not let us become "Joy" or "Light" until we leave all those burdens, impure energies and incorrect beliefs of the self behind and surrendered totally. This however is not an easy process. Some refer to inner turmoil as "battling with their demons" and "the dark night of the soul". This is the Goddess Sekhmet taking us through the process of purification that we may return to the truth of who we are. That is what the light of Ra and the Joy of Hathor symbolizes; the truth of our own divine nature that we have some how strayed from and forgotten. This then is the double face of the powerful healing of the Goddess Sekhmet/Hathor. It is what makes them inseparable in terms of healing. Both their energies of purifying, clearing the way for new consciousness (Sekhmet's function) and the infusion of it whose nature we experience as joy (Hathor's function) are required for total transformation and healing.